Idaho is a state in the northwestern region of the United States. Idaho is the 14th largest, the 39th most populous, and the 7th least densely populated of the 50 United States. The state's largest city and capital is Boise. Residents are called "Idahoans". 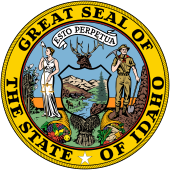 Idaho was admitted to the Union on July 3, 1890, as the 43rd state. Idaho is a mountainous state with an area larger than that of all of New England. It borders the US states of Montana to the northeast, Wyoming to the east, Nevada and Utah to the south, and Washington and Oregon to the west. To the north, it shares a 45 mi (72 km) international border with the Canadian province of British Columbia, the shortest such land border of any state. Idaho is a paradise as much for its people as for its natural beauty. Gary Lirette, "Is racism still an issue in North Idaho?" (2009), SandpointID.